A Diversified Showcase for all your dining needs. Pamper the chef in you with great cooking and dining accessories. Sign up for our monthly recipes newsletter and be entered in our product giveaway. Purchase or renew your subscription today! Click here to visit the Crochet 'N' More Magazine Stand! I NEED YOUR FEEDBACK ! (1) What would you like to see available in a learn to crochet kit? looking at illustrations or reading a instructions in print? (3) Would you like to see separate kits available for yarn and thread? to make the basic crochet stitches with detailed photos? as well as information on how to read the pattern? (6) Have you ever purchased a crochet kit? (7) If so, were you satisfied? He who speaks truth tells what is right, but a false witness, deceit. There is one who speaks rashly like the thrusts of a sword, but the tongue of the wise brings healing. Truthful lips will be established forever, but a lying tongue is only for a moment. Deceit is in the heart of those who devise evil, but counselors of peace have joy. No harm befalls the righteous, but the wicked are filled with trouble. Lying lips are an abomination to the Lord, but those who deal faithfully are His delight. And by this we know that we have come to know Him, if we keep His commandments. The one who says, I have come to know Him," and does not keep His commandments, is a liar, and the truth is not in him; but whoever keeps His word, in him the love of God has truly been perfected. By this we know that we are in Him: the one who says he abides in Him ought himself to walk in the same manner as He walked. In my trouble I cried to the Lord, and He answered me. Deliver my soul, O Lord, from lying lips, from a deceitful tongue. What shall be given to you, and what more shall be done to you, you deceitful tongue? "A LIE IS A COWARD'S ATTEMPT TO GET OUT OF TROUBLE.."
This quote is from Our Daily Bread - January, 2004 Issue. Hezekiah became king when he was 25 years old. How long did he reign? Page updated to include free patterns from December 15th issue. Includes links to helpful sites with information on how to crochet. in your online shopping basket through 1/31/04. would love to see the stitches and "how to's" in the newsletter. Free Form Crochet doesn't require a "pattern". or combination of stitches you want. pieces to form a larger item. use a slip stitch unless the designer says otherwise. 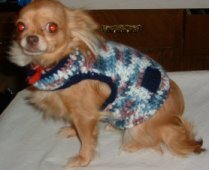 Hi , Here are pictures of two of my dogs wearing the sweater. The black one is Sassy and the brown one is Tia. 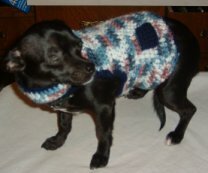 I made this sweater for my friend's dog Kacie which is really K.C. for Katie and Chris the owners of the chihuahua in the picture. I just embelished with 2 stripes and ruffles at the neck and waist. 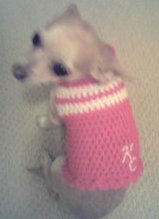 Katie informed me that she has purchased several sweaters for Kacie and this is the ONLY one she will walk in. Needless to say Katie and Kacie are tickled pink. I have been crocheting for more years that I want to admit, but the best idea that I have seen is the one to use Bobby Pins for markers. They work wonderfully for marking rows when you are crocheting in the round. 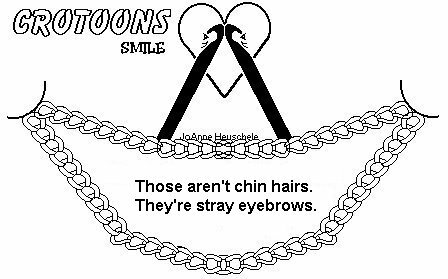 They don't tangle and can be removed easily. Thank you so much for the tip. daily chores of life...find crochet a relaxing..adventure.. I WILL ck out the rest of your site..
for I am looking for BIble studies..as well as a creative way.. I love your pattern and notice I said pattern because I have only ordered one. I only recieved it about a month ago and have done two of them. One is crazy colored and the other is two colored and in a pattern. (pineapple afghan square). Wonderfully easy pattern, when I finish this I am looking for another. Thank you, this site is now on my favorites list. it very interesting to see all the different patterns. Just found out my sweetheart husband is terminally ill. Will have lots of time to learn to crochet while we get through the next weeks. Thanks for what you do. God bless. its going to be tried out tonight! So thank you once again for your pattern. Submit your original afghan designs and win big! One $500 Winner will be selected from each category below. $500 winners for a total prize of $2000. Enter as often as you like in as many categories as you wish. Completed entry forms must be received by May 15, 2004. Afghan entries must be received by June 15, 2004. The contest is sponsored by Bernat, Caron, Lion Brand, Patons & Red Heart. This information can be found in the Spring 2004 Mary Maxim catalog on page 38.
and tips, crockpot recipes, and much more! patient who wanted to loose weight without exercising. and pick them up, one at a time...."
A kindergarten teacher asked, "What is the shape of the earth ?" One lil' girl spoke up: "According to my Daddy -- terrible! Aoccdrnig to rscheearch at Txes M&A Uinervtisy, it deosn't mttaer in waht oredr the ltteers in a wrod are, the olny iprmoetnt tihng is taht the frist and lsat ltteer be in the rghit pclae. The rset can be a total mses and you can sitll raed it wouthit a porbelm. Tihs is bcuseae the huamn mnid deos not raed ervey lteter by istlef, but the wrod as a wlohe. A goober was playing Trivial Pursuit one night. It was her turn. She rolled the dice and she landed on "Science & Nature." Her question was, "If you are in a vacuum and someone calls your name, can you hear it?" The goober thought for a time and then asked, "Is it turned on or off?" attention, when it struck him that he had forgotten something. decided he had everything with him. Yet the feeling persisted. he calls it a poem, they give him $50." piece of paper, he calls it a song, they give him $100."